I am a second-year PhD student in the Department of Computer Science at The University of Texas at Austin, where I am working with Prof. Raymond Mooney and Prof. Scott Niekum. Before joining the PhD program at UT Austin, I completed my Bachelors degree at Indian Institute of Technology, Delhi and my Masters degree at New York University's Courant Institute of Mathematical Sciences. I have interned at Google's speech team, and NVIDIA's autonomous driving team. 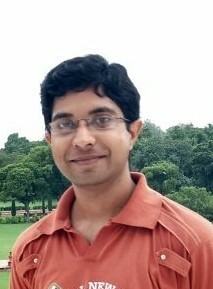 In my free time, I like reading non-fiction, and writing on Quora. I am broadly interested in machine learning, and its applications to natural language processing and robotics. 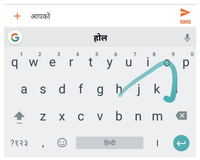 We present an extension to a mobile keyboard input decoder based on finite-state transducers that provides general transliteration support, and demonstrate its use for input of South Asian languages using a QWERTY keyboard. On-device keyboard decoders must operate under strict latency and memory constraints, and we present several transducer optimizations that allow for high accuracy decoding under such constraints. Our methods yield substantial accuracy improvements and latency reductions over an existing baseline transliteration keyboard approach. The resulting system was launched for 22 languages in Google Gboard in the first half of 2017. Most work on VAEs use a rather simple prior over the latent variables such as standard normal distribution, thereby restricting its applications to relatively simple phenomena. 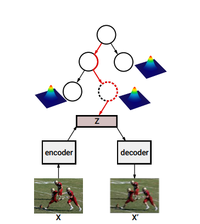 In this work, we propose hierarchical nonparametric variational autoencoders, which combines tree-structured Bayesian nonparametric priors with VAEs, to enable infinite flexibility of the latent representation space. 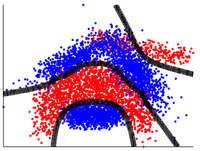 Both the neural parameters and Bayesian priors are learned jointly using tailored variational inference. The resulting model induces a hierarchical structure of latent semantic concepts underlying the data corpus, and infers accurate representations of data instances. 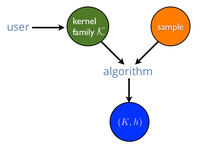 We present a new framework for learning a predictor in the presence of multiple kernel functions where the learner selects or extracts several kernel functions from potentially complex families and finds an accurate predictor defined in terms of these functions. We show that our algorithm benefits from strong learning guarantees suggesting a new regularization penalty depending on the Rademacher complexities of the families of kernel functions used. Our algorithm admits several other favorable properties: its optimization problem is convex, it allows for learning with non-PDS kernels, and the solutions are highly sparse, resulting in improved classification speed and memory requirements. Lifted inference algorithms for probabilistic first-order logic frameworks such as Markov logic networks (MLNs) identify symmetries in the first-order representation and reduce the inference problem over a large probabilistic model to an inference problem over a much smaller model. In this paper, we present two new lifting rules, which enable fast MAP inference in a large class of MLNs. We prove that our two new rules are sound and demonstrate via a detailed experimental evaluation that our approach is superior in terms of scalability and MAP solution quality to the state of the art approaches. We generalize Localized Multiple Kernel Learning so as to learn a tree-based primal feature embedding which is high dimensional and sparse. We develop routines for optimizing over the space of tree-structured features and efficiently scale to problems with more than half a million training points. Experiments on benchmark data sets reveal that our formulation can reduce prediction costs by more than three orders of magnitude in some cases with a moderate sacrifice in classification accuracy as compared to RBF-SVMs.